Notice when I search for the common term like "Button" I get a lot of similar search results. Microsoft do two things to help users distinguish between the various search results. eg. <title>Button Interface (Microsoft.Office.Interop.infoPath.SemiTrust)</title> -- So a more descriptive text than just Button Interface (see example image below). Set the "Version: ..." text. This is explained below. <meta name="Microsoft.Help.TopicVersion" content="some version number" /> -- Used internally by Microsoft. 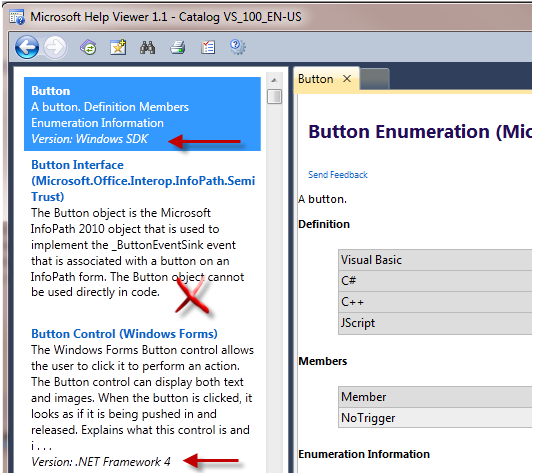 This key is available in both HV1 (VS 2010 help) and HV2 (VS 2012 help). It is used internally by Microsoft and has limited use to 3rd party authors. If a topic contains the following meta statement then the help engine displays a version string according to the version number specified. This table from the MSDN web site thirdBlogFromTheSun.com shows allowed version numbers and the corresponding version text displayed. Microsoft.Help.TopicVersion does not allow free text so this tag is limited in value. will show the text "Version: .NET Framework 4" appended to that topic's info when it appears in search results (see 3rd search result item in screen shot above). 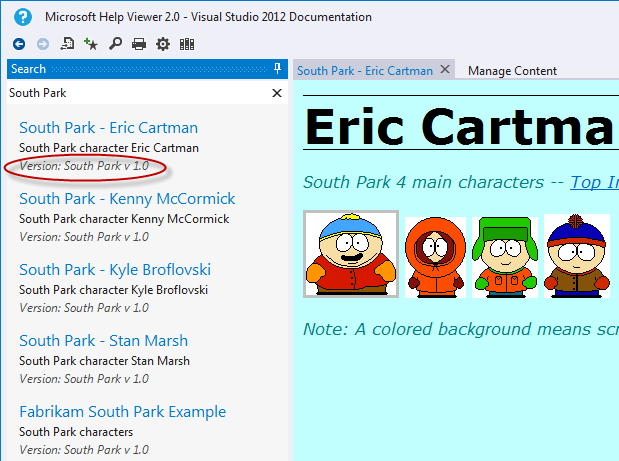 This key is new to HV2 (VS 2012 help) and allows you to output custom version text under each topic's search results. Here's an example of the meta tag you would put in your topics header.